In 1960 a brash young boxer from Louisville, KY, came on the scene. Cassius Clay won the National AAU light heavyweight title defeating Roy Ector at 0:55 of the third and last round in Louisville. In the Golden Gloves he won the Inter-city title April 7th defeating Joe Reynolds in Toledo, OH. He qualified for the Olympic Trials. He won the Eastern Regional defeating Henry Cooper by TKO2 at 2:49 in Louisville. In the Trials he would go onto defeat Fred Lewis by DEC and Allen Hudson by TKO 3 in San Francisco. In the finals he defeated Yvon Because TKO 2 at 1:50 in Rome. He had competed at heavyweight but lost to Percy Price of the Marine Corp out of Philadelphia so he was allowed to compete at light heavyweight. In the Olympic Games in Rome Clay defeated Genadiy Schatkov, Australian’s Tony Madigan and for the Gold Medal he defeated 3-time European Champion Zbigniew Pietrzkowski of Poland. The world now was his as he would turn professional in October of 1960. There have been different records shown for him such as 134-7, 137-7, 99-8 and 61-6. There have been reports Clay lost in 1955 to James Davis in the Novice GG tourney. In the same year he lost to John Hampton. In 1957 he lost to Donnie Hall by split decision. He lost to Terry Hodge by TKO1. He lost to Jimmy Ellis whom he would split with, in the amateurs. In 1958 Clay was TKO by 2 Kent Green. At the Pan Am Games he lost to Amos Johnson in the semis. Percy Price was the last to defeat him in the Olympic Trials. That’s at least seven losses. Some reported he ended up 100-7. 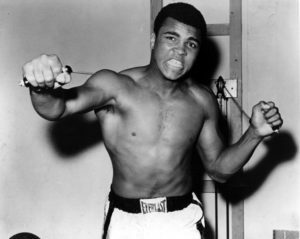 He would turn professional in October of 1964 and win his first nineteen bouts earning him a Championship bout with Heavyweight Champion Sonny Liston. Clay would win the title when Liston couldn’t go on after six rounds. The fight was even with each boxer getting a vote and the other judge a draw. After this fight he announced he had joined the Islamic faith and would be called Muhammad Ali. Ali would go onto win the title three times after losses. His final record was 56-5 with 37 knockout wins. He only lost once by stoppage. As a husband he lost three times before being married a fourth and last time. Ali became quite a humanitarian. In 1990 he went to Iraq where their President Saddam Hussein allowed him to bring back fifteen American hostages. This in itself was remarkable.